It’s not uncommon to see Mac scareware doing the rounds, but Cleanup My Mac virus is a potent threat that outstrips most counterparts in terms of prevalence. Mac scareware is on the uptick. These electronic culprits mainly pose as must-have utilities to boost system performance and clean up all sorts of junk. Ideally, such features are really welcome as Macintosh computers get cluttered with unnecessary files and software leftovers that parasitize on disk space. Unfortunately, some software publishers that don’t take the ethical element of their business seriously have been releasing apps whose activity is about mimicking rather than actually optimizing. The malicious players who masterminded the Cleanup My Mac virus campaign, for instance, pursue the abominable goal of manipulating users through fake issue detection reports. Also known as Cleanup-My Mac, this phony program slithers into machines in a furtive way, instantly achieves the persistence effect, and inundates the victim’s computing experience with fake scans as well as annoying popup alerts. The distribution of Cleanup My Mac relies on a malvertising stratagem where users are redirected to misleading web pages when they visit regular sites. This interception of web traffic can be blamed on corrupt scripts stealthily embedded into popular web resources. Another likely scenario involves a browser hijacker that infiltrates a Mac without the admin’s awareness. A bundle of multiple items combined under a single installation client’s umbrella is the most common entry point for the redirect malware. When the web surfing routine is forwarded to the deceptive site, such as apple.com-scan.live, the user sees a warning message that says, “Your Mac is heavily damaged”, “Your Mac is infected with 3 viruses” or similar. The linked-to download that will purportedly fix the problem leads to the Cleanup My Mac payload. Cleanup My Mac may re-infect your Mac multiple times unless you delete all of its fragments, including hidden ones. Therefore, it is recommended to download Freshmac and scan your system for these stubborn files. This way, you may reduce the cleanup time from hours to minutes. Download NowLearn how Freshmac works. If the utility spots malicious code, you will need to buy a license to get rid of it. As soon as the rogue application is in, it meddles with important system set-ups such as Login Items and LaunchAgents. This way, it makes sure that the obtrusive binary is triggered every time the Mac is booted up and cannot be easily terminated. Then, the malady enters the active stage of its attack. It displays a fabricated scan that pretends to evaluate the current performance condition of the system by the following areas: cache, logs, extra languages, rogue apps, trash, duplicates, and large files. Given the indecent gist of the app, it comes as no surprise that it reports dozens or hundreds of issues by each category. Then, the bogus repair phase of Cleanup My Mac’s modus operandi comes into play. It strongly recommends that the user fix all the spotted issues by activating the full version, which boils down to purchasing a 2-year license for $118.80. Paying for a counterfeit cleaner that solves inexistent problems is a questionable venture, to put it mildly. Under the circumstances, the best option is to get rid of the Cleanup My Mac virus in the first place. Be advised that an important component of the repair is to rectify the settings of the web browser that may have been hijacked by a troublemaking plugin or extension and will otherwise continue to be redirected to unwanted web pages. Use the walkthrough below to get the job done. When confronted with malicious code like the Cleanup My Mac virus on Mac, you can neutralize its toxic impact by leveraging a specially crafted system utility. The Freshmac application (read review) is a perfect match for this purpose as it delivers essential security features along with must-have modules for Mac optimization. This tool cleans unneeded applications and persistent malware in one click. It also protects your privacy by eliminating tracking cookies, frees up disk space, and manages startup apps to decrease boot time. On top of that, it boasts 24/7 tech support. 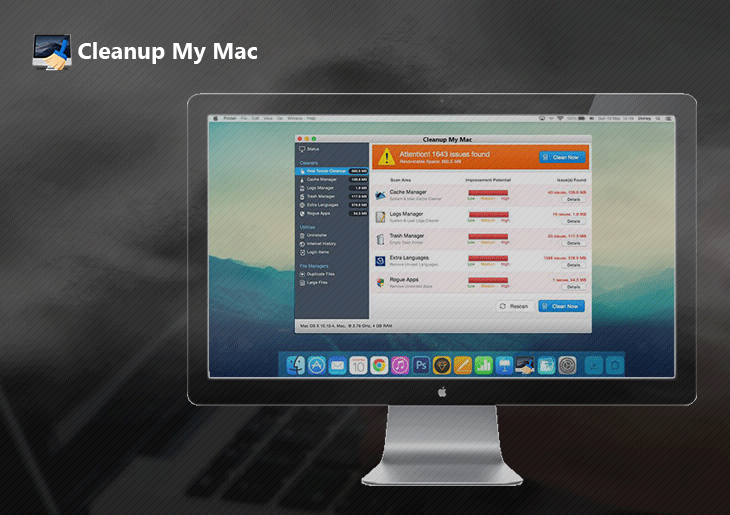 The following steps will walk you through automatic removal of the Cleanup My Mac infection. Check whether the Cleanup My Mac issue has been fixed. If it perseveres, go to the Uninstaller option on Freshmac GUI. Locate an entry that appears suspicious, select it and click Fix Safely button to force-uninstall the unwanted application. Go to Temp and Startup Apps panes on the interface and have all redundant or suspicious items eliminated as well. The Cleanup My Mac malware shouldn’t be causing any further trouble.